A PLAQUE IN THE gardens of the sultan’s palace in Melaka reads: “Whoever is lord of Malacca has his hand on the throat of Venice.” For centuries this passage of water, 620 mi (1,000 km) long, connecting the INDIAN OCEAN and the South China Sea, running generally northwest to southeast, lived up to this reputation as one of the most important TRADE ROUTES in the world, the meeting place of east and west that influenced the economies of states as far away as Venice, ITALY. The straits flow between the Malay Peninsula and the island of SUMATRA, ranging in width from 9.2 to 125 mi (14.8 to 233 km). The narrowness of these straits, combined with their economic importance as the shortest sea route between three of the world’s most populous countries — INDIA, CHINA, and INDONESIA—makes them one of the most strategic economic zones in the world today. The first major empire in Southeast Asia, the Srivijaya, based its power on control of the straits in the 7th century. Located roughly at the midway point between INDIA and China, the straits drew traders from both of these nations who established settlements along its banks. Attracted mainly to the spices of the east but also to trade in hardwoods, silks, porcelain, slaves, and exotic animals, Arab traders arrived in the area, followed by Portuguese and Dutch traders. The city of Melaka ultimately became a British possession, along with the important island trading settlements at the northern and southern ends of the straits, Penang and SINGAPORE. In 1824, these settlements were joined together by the British East India Company to form the Straits Settlements Colony (with its capital at Singapore). The Dutch East India Company controlled the southern shores of the straits (on the island of Sumatra) but were never able to consolidate a counterbalance to British control because of the swampiness of this coast and the ongoing difficulties they encountered with the local sultanate of ACEH. The opening of the Suez Canal in 1869 created even more traffic in the straits, and British Singapore developed into one of the world’s major trade ENTREPOTs, rivaling Spanish Manila and Dutch Jakarta. Ships from Europe, India, and China had to pass by Singapore, and early on it was a free port, unlike its colonial rivals. The northern coast of the straits was transformed by the British into rubber plantations and settled by thousands of Chinese and Indian workers. This area still has one of the greatest concentrations of Indians outside of South Asia. Another big industry stimulated by the British was tin because of the close proximity of its source in the Main Range to the coast (about 25 to 30 mi or 40 to 50 km). The northern coast of the straits, hemmed in by this mountain range, has only about a quarter of the land of the Malay Peninsula, but 85 percent of all economic activity, and the 10 largest cities, including the capital of MALAYSIA, Kuala Lumpur, and its port city, Kelang. Singapore is mostly populated by Chinese, and continues to dominate trade in the region. The southern coast, now part of Indonesia, remains largely undeveloped. Both coasts of the Malacca Straits are mostly unbroken mangrove swamps and mudflats, with a few bays that shelter coconut palms. 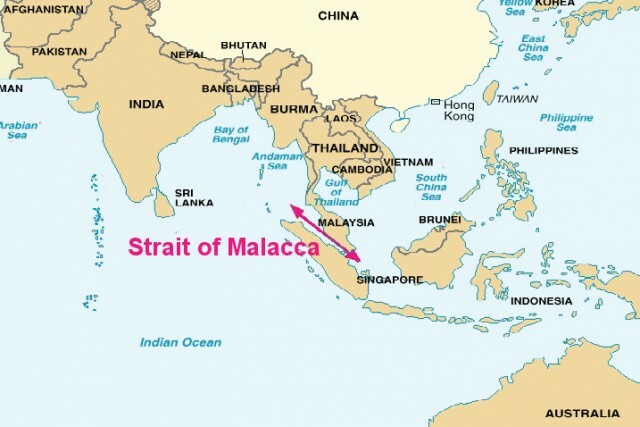 Today, the Malacca Straits are considered one of the world’s oil transit CHOKE POINTs, with an estimated 11 million barrels per day passing between its shores from the MIDDLE EAST to JAPAN, China, and the rest of the Pacific Rim. Some 900 ships per day (or 50,000 per year, carrying nearly $1 trillion in goods) pass through this natural choke point bottleneck, with significant potential for disaster from collisions and spills, piracy, and terrorism. The straits also support large fishing and tourism industries, which are also threatened by shipping accidents and oil spills.